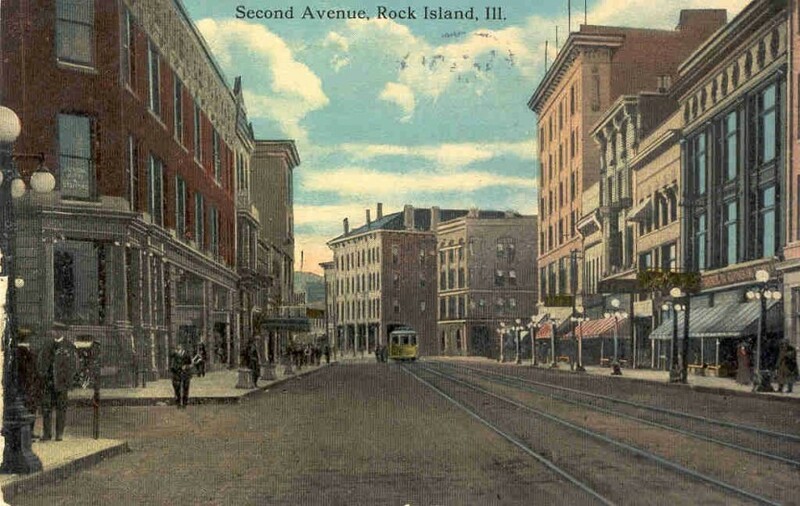 Second Avenue is the undisputed heart of downtown Rock Island, both historically and today. It has been the destination of shoppers, tipplers, and travelers, of salesmen, milliners, attorneys and blacksmiths. Historically, the commercial area extended from 15th to 20th Streets. West of 15th Street the avenue was residential, while east of 20th Street, the Chicago, Burlington & Quincy depot and railroad yards filled the block. In addition to being the heart of downtown, Second Avenue was photogenic, thanks to the bend at 17th Street which allowed for a great view of the street. As a result, it was the subject of many photos such as the one reproduced for this postcard, which is postmarked 1913. It shows Second Avenue looking west from 18th Street. Most of the buildings depicted are still standing on Second Avenue, although some are hardly recognizable today. At the very center of the picture, with lots of chimneys sprouting from its roof, is the four-story Rock Island House hotel. It was built in the mid 1800s as a two-story hotel and was later enlarged upward. The current Ann Goldman Building was constructed by actually incorporating the old Rock Island House. More recently, it was renovated for apartments – coming full circle in residential use. Just to the right of the Rock Island House is the predecessor building for the current bank. Farther right is the Best Building – now called the VanDerGinst Building. Other prominent buildings on the block are The London (Quad City Arts home), the Fries Building, with circular windows, and the People’s National Bank at the far right. The latter two buildings were also historically renovated for apartments. Across the street, the building at the left edge of the postcard was originally called the Robinson Building. The corner storefront was used as a bank for a long time, while storefront space farther west along the avenue had various retail uses over the years. Upstairs were offices as well as the Masonic Temple. This is an example of a building whose exterior was changed a great deal in a 1909 remodeling. Be sure to observe the details in this street scene – you can probably find more than we did. Ornate Victorian style electric lights line only the right (north) side of the street. Why? Noticeably missing, compared to earlier downtown photos, are tall power poles, with as many as a dozen crosspieces. Whether they were really removed or simply painted out of the photo on which the postcard is based is unknown. There are trolley tracks in the street, and a trolley can be seen in the background. This is the only indication of other than pedestrian travel. Apparently there was no traffic problem in 1913 – it would be difficult to paint autos or buggies out of the picture. For some years, there was a pedestrian plaza between 17th and 19th Streets, but the stretch between 17th and 18th Streets was returned to auto use. Notice the awnings at storefront level on the south-facing buildings as well as a few more, some retracted, on higher windows. Regulating sun inside was critical in controlling interior temperatures and also kept window displays from fading. This postcard was published by the Davenport Postcard and Novelty Company in Davenport and copyrighted by A. R. Bawden. Thanks to Mike Bawden, President of Brand Central Station in Riverdale, we learned some history of this postcard and his family. Mike’s grandfather, Ray, along with his two brothers Harry and Al (A.R. ), ran a cigar store near Second and Brady in Davenport. The store, which later moved to a location on 3rd Street across from the Orpheum (now Adler) Theatre began selling postcards and magazines as well as tobacco. The postcards proved very popular – so popular that the Bawdens began to photograph and print their own postcards. Photos, probably taken by Harry, were of local scenes such as this one, as well as of circus freaks, brought here for chiropractic research and treatment by B. J. Palmer. The small printing company continued to expand over the years into a huge well known establishment – Bawden Bros. The cigar store? Only a Bawden family memory. This article by Diane Oestreich is slightly modified from the original, which appeared in the Rock Island Argus and Moline Dispatch on September 16, 2001.